2 Beds 2 Baths 832 Sq. ft. Outstanding corner two bedroom/2 bath condo conveniently located across from the Wyndham Garden Resort on Fort Myers Beach. Enjoy lots of light in the open floor concept living/dining area with additional windows in this corner unit. Neutral tile and freshly painted walls throughout. Kitchen features granite countertops with breakfast bar, stainless steel appliances, & white cabinetry. Tasteful furnishings & furniture are included. Comfortable master suite features sliding glass doors to lanai, a lovely updated bath & a large walk-in closet. The lanai offers a secluded spot facing a preserved estuary. Stackable washer & dryer are in unit.Estero Cove owners have on-site management, deeded beach access, under building "owner" parking spots, and a fascinating nature trail to the Back Bay Area. Storage unit #39 on the ground level for this unit is perfect for beach chairs, etc. Recreational facilities include a large community pool, tennis courts, shuffleboard, Bocce ball, plus a barbeque & picnic area. 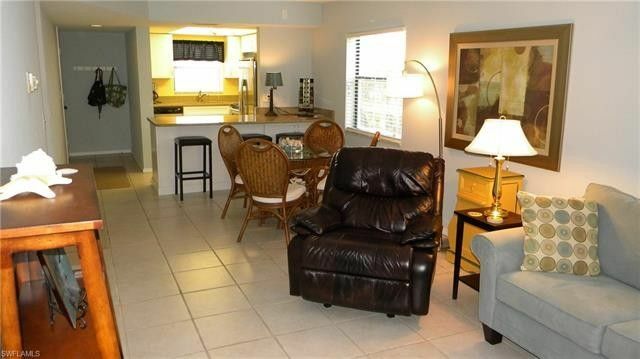 Within an easy walking distance to CVS, Santini Plaza, shops, restaurants, movie theater, Farmers' market, and marinas. Directions: Take Estero Blvd, on Fort Myers Beach to 6899 Estero Blvd. Directly across from the Wyndham Resort.